It'll make you cackle! Mother Hen looks on with pride as three roly-poly chicks dance around the nest. A fourth chick, exhausted from the ruckus, reclines on Mama's tail feathers. 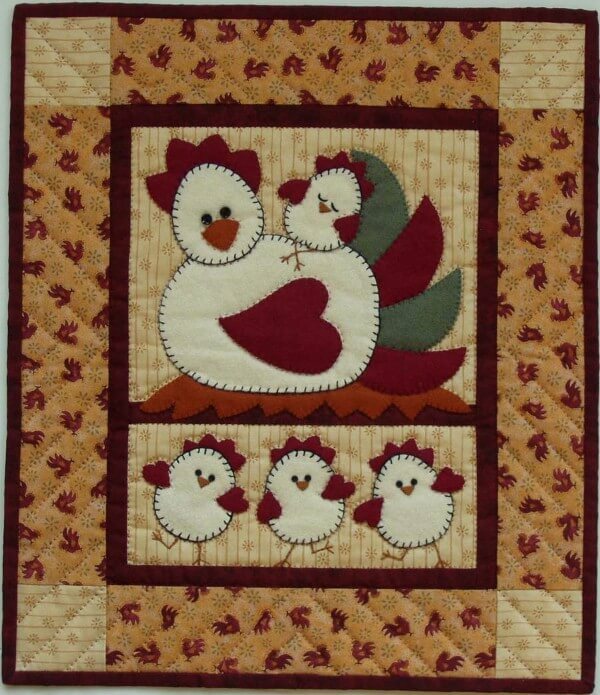 Bright chicken print fabric borders this happy family. Finished size is 13in x 15in. Colors are soft yellow, amber, dark red, cream, and spruce. Kit includes all wool felt for appliqu� shapes, all fabrics (100% cotton) for background, borders, back, and binding, batting, buttons for eyes, embroidery floss, precise patterns and complete instructions.